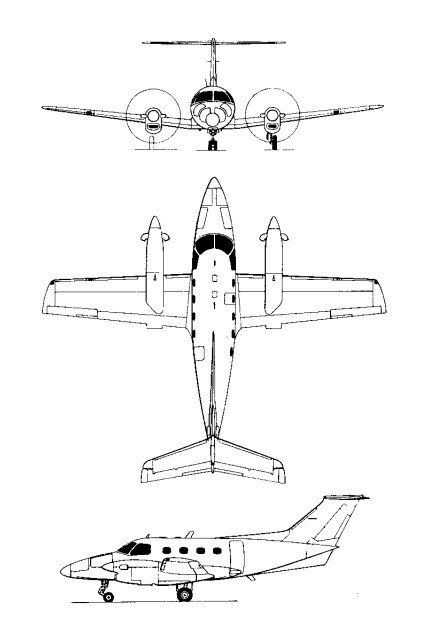 The pressurised EMBRAER EMB-121 Xingu featured a reduced-span version of the EMB-110P wing, a fuselage of circular cross-section similar to that of the Brasilia, and followed the same general configuration with twin turboprop engines and retractable tricycle landing gear, but differed by having a cantilever T-tail. The first pressurized twin-turboprop general -purpose transport to be built in Brazil, it had accommodation for a crew of two and nine passengers. The prototype Xingu (PP-ZXI) flew for the first time on 10 October 1976, followed by the first production aircraft just over six months later. The Xingu has PT6A-28 engines, six-psi pressurization, an anticipated cruise of 265 knots at 12,000 feet, a five- to nine-place cabin and max gross of 11,000 pounds. The original version, designated EMB-121A Xingu I, was powered by two Pratt & Whitney Canada PT6A-28 turboprop engines. From this was developed the EMB-121A1 Xingu II with 559kW PT6A-135 turboprops, these being available also as retrofits for the Xingu I. Thirty-two earlier machines were later reworked to this standard. A prototype of the EMB-121V Xingu III was flown. It was generally similar to its predecessors except that it had the fuselage lengthened by 0.89m, and was powered by two 634kW PT6A-42 engines. Seating the same number of passengers but in greater comfort, the Xingu III featured an optional 'club' layout for seven passengers, with folding tables and a galley. A total of 111 were built, including six for use by the special transport group of the Brazilian air force under the designation VU-9 as a VIP transport. Other users include the French navy and air force with 41 aircraft as multi-engined trainers and liaison aircraft, and five others serve with the SABENA pilot training school. Production of the Xingu 121 ended in 1986. Engine: 2 x P&WAC PT6A. Initial ROC: 550 m / min. Range/payload: 1630 km with 780 kg.